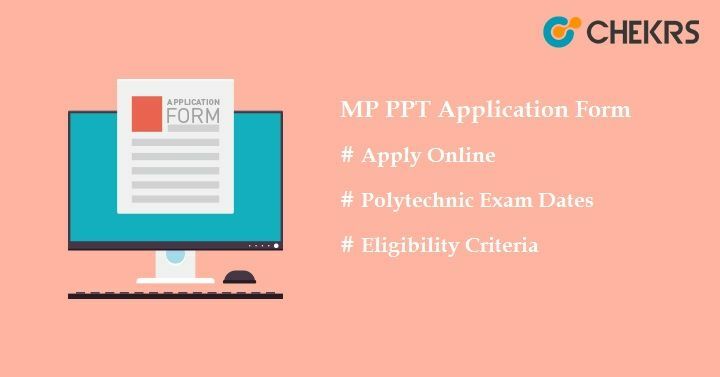 MP PPT Application Form 2019: MP PPT (Madhya Pradesh Pre-Polytechnic Test) is a polytechnic entrance exam conducted every year for the candidates who want to take admission in various diploma courses. Madhya Pradesh Professional Exam Board (MPPEB) or Madhya Pradesh Vyapam will conduct the MP PPT 2019 in month of April/ May for those candidates who belong to Madhya Pradesh state and interested to take the exam. MP PPT is a state-level entrance exam providing admissions in various government & private polytechnic institutes across the Madhya Pradesh state. MPPEB will commence the Madhya Pradesh PPT Application Form on its official site. It will be filled through online mode. Candidates who want to appear in this exam have to fill the form and submit the form before the last date. If required, changes can be possible in the application form in the month of April after opening of Correction window on the MPPEB portal. Candidates must check the MP Pre-Polytechnic Test Eligibility Criteria before applying for the MP PPT application form. Candidate must have Indian nationality to appear in this exam. Candidates should be permanent residents of Madhya Pradesh. Candidate must have obtained minimum 50% in class 10th /equivalent examination from recognized board. Candidates who have passed 10th with grace marks can also apply. All the necessary documents should be scanned & kept ready to upload while filling the application. Candidates are advised to visit the official site of MPPEB to apply online form. Click on the link “Apply online”. Read all the instructions carefully and click on “Continue” button. Fill all the details like personal, educational details, contact and other asked details. Then, upload the scanned images such as photograph & signature in the box given on the form according to the specified format given below. Photo must be clear, having white background with name and date of taken below the photograph. Declaration Message written on the form must be re-write in the box by the candidate’s in their own handwriting. After filling details & uploading the images, candidates have to pay the application fee. Fee can be paid through online mode only via credit card/debit card/net banking etc. Applicants can also pay the fee via Kiosk portal of vyapam. The application form must be submitted by candidates after the completion of payment. Take the print-out of submitted form for future use.